The word bible is derived from the Greek word biblia meaning books. The term which originates from Byblos an ancient Phoenician city which traded in papyrus used in producing a paper like substance for writing upon. Scriptures and scrolls were among the earliest of hand written books. Though one of the world's youngest religions, Sikhism too has a holy book of scripture compiled from various hand written texts. The sacred scripture of Sikhism is written in the Gurmukhi script and bound in a single volume. Sikhs believe that their scripture called Guru Granth is the embodiment of truth, and holds the key to enlightenment and thus, salvation of the soul. Arjun Dev, the fifth Sikh guru, compiled the verses which make up the Sikh scripture. It contains poetry of 42 authors including Guru Nanak, six other Sikh gurus, Sufis, and Hindu holy men. Tenth Guru Gobind Singh,declared the scripture of the Granth to be his eternal successor and the Guru of the Sikhs for all time. Therefore, Sikhism's Holy Scripture known as the Siri Guru Granth Sahib, is last in the lineage of the Sikh Gurus, and can never be replaced. Like Christians believe the bible to be the living word, Sikhs believe the Guru Granth to be the embodiment of the living word . "In the beginning was the Word, and the Word was with God, and the Word was God." John 1:1 King James Bible, book of John, first chapter, first verse. 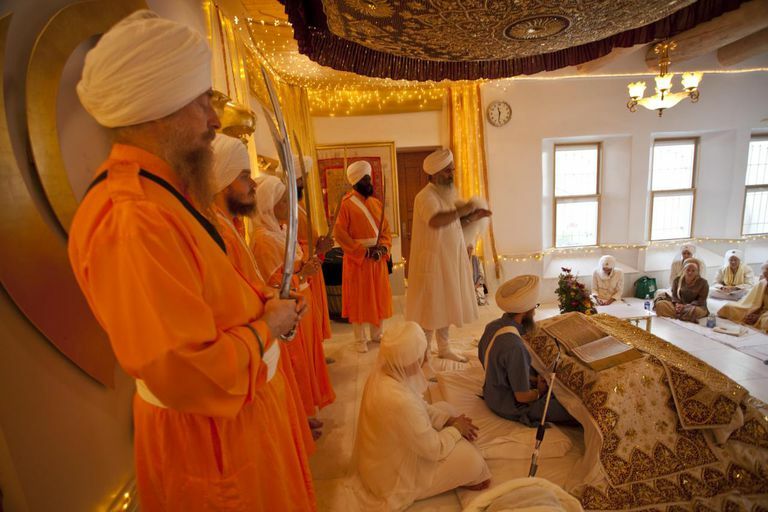 Before reading the holy words of Guru Granth Sahib scripture, Sikhs invoke the presence of the living Enlightener with the prakash ceremony and petition the Guru with the prayer of ardas. Only after the ceremony is performed following strict protocol, is the scripture permitted to be opened. A hukam is taken by reading random verse aloud to determine divine will. At the conclusion of worship, or at days end, a sukhasan ceremony is performed to close the Guru Granth Sahib, and the scripture is put to rest.